James decided to leave the RAF to retrain as a Level 3 Personal Trainer, and together they followed their dream to open their own fitness studio. Kat spoke to us about the support from Nwes, and how a Start Up Loan, and the Start & Grow programme helped them to make a life-changing move. Tell us about Norwich Fitness Academy? 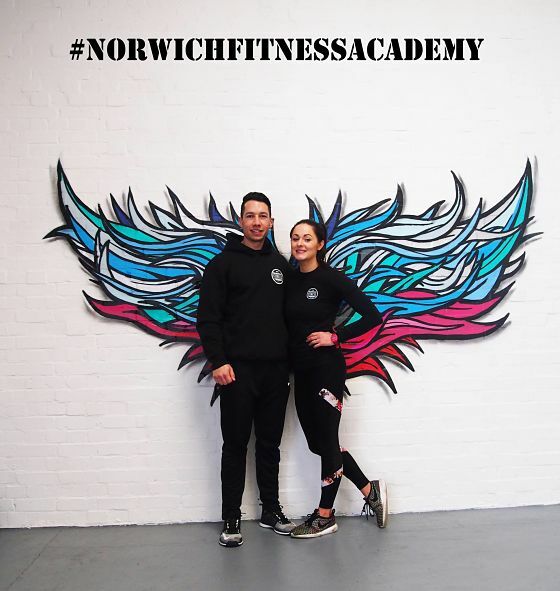 The Norwich Fitness Academy is a new Personal Training studio and Bootcamp club located on Norwich’s outer ring road. Kat and James founded the business in October 2016 and worked hard to launch in March 2017. A lot of people can find conventional gyms and Bootcamps to be quite intimidating. Here at The Norwich Fitness Academy, we cater for all abilities and have a warm and welcoming atmosphere. Our aim is to encourage and guide our members, in order to get the best out of their workouts, not shout at them. Our club is a social hub as much as it is a fitness centre. Our members walk through our door as strangers and leave as friends. The response from the public has been so overwhelmingly positive that we are 100% certain that pursuing our own business start-up has been the right decision. The power of social media ensured that 95% of open day places were filled prior to the day itself. The main feeling was one of relief! We also gained over 1,000 followers on our Facebook page before we had opened our doors. This showed that what we were offering was unique and interesting to those based in and around Norwich. Did you face any challenges? How did you overcome these? We faced challenges head-on, including negotiating the lease, and understanding the legalities concerning the change of use to secure our chosen premises in an industrial unit on the Norwich Ring Road. We have been on a steep, but useful learning curve when it came to developing business skills and experience. We believe those who succeed in business are those who are genuinely passionate about what they are trying to achieve. Anyone can have a good idea, but without passion, the will to push through, even when things aren’t going your way, is not there. What support did you receive to make your idea of The Norwich Fitness Academy, a reality? I walked through the doors of Nwes’ Norwich Enterprise Centre on Guildhall Hill by chance one day. We were put in contact with Business Advisor, Paul Walmsley. Not only did Paul help us to develop our business plan and financial forecasts, but we also attended free workshops to enhance our skills further in business, finance, and marketing. Walking through the doors at Nwes was the best decision we made in planning our business. We worked with Paul to submit an application for a Start Up Loan, which really propelled our dream forward. What impact has Nwes’ support had? Paul not only helped us with our business plan, financials and booking us onto courses, but he also instilled confidence into us that our business was going to be a success. It was the first time we’d heard that from someone who wasn’t a friend or a family member. I remember leaving his office for the first time with more determination than ever to make our business a reality. In addition to all the knowledge and time that Paul gave us, it was his belief and genuine enthusiasm in what we were doing that had the most valuable effect. We also attended free business skills workshops, which were brilliantly delivered by Nwes Trainer, John Clarke in a way that put aside and jargon and simplified it in a way that we could actually understand. These and meetings with Paul made us think more about our business and how we could grow. They also taught us the importance of organisation from the outset, something I feel we would have otherwise overlooked. The impact of Nwes has been significant and, having enjoyed a very successful launch in March, we are immensely proud of everything we have achieved. What is your advice for others who are considering becoming self-employed? We made sure we were in a position, not only financially but mentally, to pursue the goal of opening the gym. The whole process was stressful and time consuming – but worth it. The stress is only short term. The main advice we would give would be, when you feel ready, go for it.